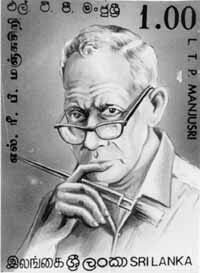 The 100th death anniversary of the patriotic painter Manjusri falls on 28th, October 2002. He can be classified among the countrys several patriots such as Anagarika Dharmapala, Walisinghe Harischandra and D. S. Senanayaka. He performed a unique task of preserving living records of the lost heritage of temple art and paintings in ancient Lanka which display Jataka stories depicting the life of the Buddha. This enabled the future generations to admire, glorify and understand the intricate designs of Sinhala Art, which sparsely appear now only on scattered rock carvings among the ruins of ancient architecture. It was no mean task for the tireless frail man of small built to trek the animal infested jungles in remote country in search of abandoned and dilapidated treasures in art among the small temples now no more. Once during the Japanese war days, he, in his yellow robes carrying loads of copying paper in metal bamboos was mistakably suspected as a spy of the Japanese forces. He pursued his objectives single handed ly against all odds and inconveniences he underwent in the remote villages. Born on 28th, October 1902 into a not so wealthy family in Aluthgama he was educated at a vernacular school in the locality and off school hours he learned carpentry. From small age Manjusri was fascinated by folklore and poetry and also interested in Jataka stories. He valued them more than Grims Fairy Tales which were translated into Sinhala and read at school. He learnt that monks could travel through the air by the power of meditation as illustrated in some Jataka stories he had heard. Therefore desirous of achieving this power, he indulged in meditation for long hours foregoing his meals at times. This behaviour prompted the parents to decide on ordaining him as a Samanera monk. At the age of 13 he was ordained a Samanera at Mangala Pirivena, Beruwala, which was a great seat of learning and abode of many erudite monks well versed in the Dhamma and languages. Here as a devoted Samanera he learned the Dhamma and three languages Pali, Sinhala and Sanscrit, a requirement for a full-fledged monk. He also studied the science of astrology which was handy for him in everyday life. It was as a Buddhist monk that he first studied making copies of temple paintings and also doing his own original paintings. Beyond the confines of his education and training as a monk, he fell in love with the Cultural Art of Temple Paintings and made a firm resolve to preserve them for the future. For nearly 50 years, he had travelled the islands lonely roads in remort jungles to visit unknown dilapidated temples to record the dwindling frescoes with unfailing devotion eschewing all comfort and roughing out on meagre meals spending his time alone in unparalled patriotic fervour recording the elegant frescoes for the adulation and pride of future generations before they crumbled down or are tempered upon by enthusiastic thoughtless monks to modernise the temples thus forcing the precious frescoes to eternal oblivion. On 28th, August 1943 a group of ten people met at Lionel Wendts house in Colombo to form 'The 43 Group' consisting of artists; Ivan Peiris, Lester James Peiris, Aubrey Collette, George Classen, Richard Gabriel, Harry Peiris, and Lionel Wendt. Among them was the solitary monk Manjusri and at their first exhibition those displayed by Manju Sri were unique. All were stunned by the perfection and detail in the work he had produced. He held several exhibitions in the European countries displaying temple paintings and some of his original works. He was extremely well received and earned great renown as a successful painter. Manjusris art and expertise flowered without any University training. The splendid pinnacle he had reached by individual self effort. He did never receive state assistance for his work. On 28th October 1977, Mrs. J. R. Jayewardene at a graceful ceremony launched his book titled "Designs and Elements of Sri Lankan Paintings" containing total of his 55 years of hard work, which is a collection and record of gems of epic drawings and sketches entrenched in temples and rock caves all over the island, embracing a vital part of our countrys heritage. He had the foresight to preserve the fast vanishing temple art depicting facets of history and art. He copied frescoes of 18th and 19th centuries but paintings on Situal Pauwa, Mulkirigala, Sigiriya, Mihintale, Pidurangala, Polonnaruwa, Koobiyangala, Hindagala, Dambulla, Telwatta, Ratnapura and Dimbulagala were much more older. The Archeological Society of Sri Lanka, gratefully undertook the printing and publishing his book as a tribute to him to felicitate him on his 75th birthday. In 1979 Manjusri was awarded the Ramon Magasaysay Award for Creative Art. His fine line drawings in characteristic floral designs and patterns is a true natural style of art. His last assignment was the adorning of the walls of the new parliament building at Sri Jayewardene pura, Kotte, helped by his talented children, two daughters and a son Eushan who now follows his fathers footsteps. If we are honestly proud of our heritage, Manjusri should be elevated to a higher position among the revolutionary traditional artists of Sri Lanka. It is timely for the Cultural Ministry to publish a commemorative stamp of this great man on his birthday which falls on October 28th.